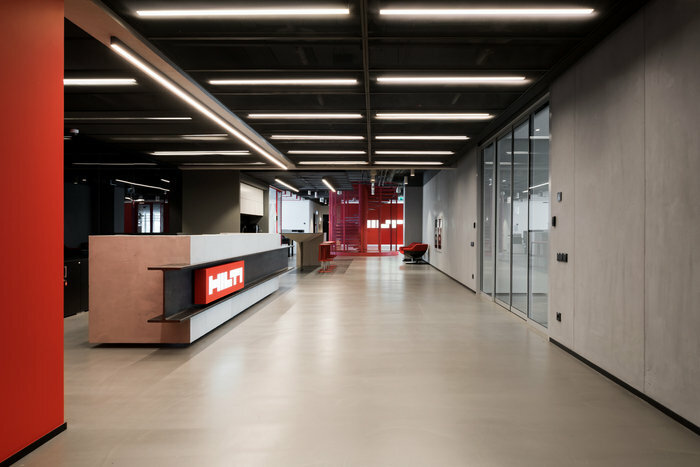 OFFCON architectural bureaue has created the design for global construction corporation HILTI‘s Eastern European headquarters located in Moscow, Russia. When HILTI, a global construction corporation, turned to OFFCON, their initial request was to update their current office and come up with an idea of a Client Zone that would serve as a space for demonstrating their innovative solutions and telling the company’s history. However, after analyzing the current situation, architects found out that the existing office has a very poor connection between departments, lacks collaboration areas and meeting rooms, and has outdated engineering systems. This analysis inspired the client to move to a new office. The selected building with its floor to ceiling windows was a great canvas for implementing architectural ideas. OFFCON decided to connect two 1500 sq. m floors with custom-made circular staircases, that later became a main feature of the office. The inspiration for them was a diamond drill bit – one of the HILTI products. Remarkably, the openings for the staircases were made with HILTI equipment and technologies. The concept of the office is a construction site with its concrete surfaces, rough metal fixtures and metallic grid. Thin red diagonal line, a new element of HILTI branding, also inspired some architectural decisions. Thus, meeting rooms partitions have a strong diagonal in places where the solid partition meets the glass which, in addition, has thin red frames. An icing on the cake was the reception desk in a shape of a concrete block with an I-beam recessed into it. Traditionally, open work areas with height-adjustable tables were placed along the panoramic windows. These areas don’t have any hierarchy and are equally convenient for all employees to use. Even those departments, that are usually separated, such as Accountants and IT, were seated in the open area, as the client wished. Enclosed head offices were done in the same manner as the rest of the space and, when not in use, can be utilized as meeting rooms by any employee. This approach emphasizes HILTI values regarding equality. Meeting rooms and collaboration areas were placed in the core, with coffee-points and copy areas evenly distributed for everyone’s convenience. Amenities include gym with changing rooms and showers, massage room and a library, that is supposed to be used for concentration work and therefore, should be kept silent at all times. The Client Zone has a special room for demonstration of HILTI tools in use on concrete, so it required a special acoustic project, that was successfully implemented by OFFCON. Overall, architects paid special attention to acoustic comfort in this office, which was achieved with Ecophon ceiling baffles. All meeting rooms have electronic reservation system that can be used by any employee through their computer or smartphone app. The massage room can be reserved through this system as well. The Client Zone is equipped with a large screen that broadcasts information about the company, its’ employees and new products. In the future this screen will be used for video-conferences with HILTI headquarters in other countries. For instance, the Head of Texas headquarters will be able to greet visitors of Moscow headquarters.